Lots of things are happening this week, so here’s a quick update, plus an answer to one reader’s question about grounding a 50-amp pedestal outlet an electrician is installing at their house. 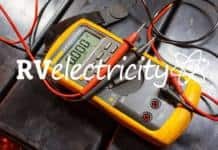 We just launched our Facebook RV Electricity group a few days ago, and in two days it has more than 300 members in the group. This is where I’m planning to get the majority of my reader questions from instead of relying only on comments in the articles. We’ll see how this goes, but you all seem really interested in having additional information on RV electrical safety, maintenance and troubleshooting. This will probably have more than 1,000 members by the end of the weekend, so please join our new Facebook group HERE. Last season it was a struggle to get any RV shows or rallies at all to host one of my RVelectricity seminars, but this year they’re really interested. Every time I did a seminar or clinic about RV Electricity I packed the room and got really high ratings. For example, I just did a seminar at the RVillage Rally 2.0 in Florida last Saturday, and instead of the 40-50 we were expecting, I’m told there were more than 100 in the room (as you can see from my composite picture above, which wasn’t wide enough for the entire crowd). Curtis from RVillage even allowed me to expand my normal 60-minute seminar to 90 minutes. Then after I broke down the presentation gear I continued to answer questions out in the garden for another 90 minutes; then I answered more questions at my table during lunch for 30 minutes; followed by a 2-hour dinner with a bunch of RV technicians and design engineers who asked tons more questions about the latest Electrical Code now allowing 3-phase power in campgrounds, the design of better surge protection systems, and how to help protect customers from hot-skin/contact-voltages. You would think I’d get tired of answering questions about electricity, but I really love this stuff. 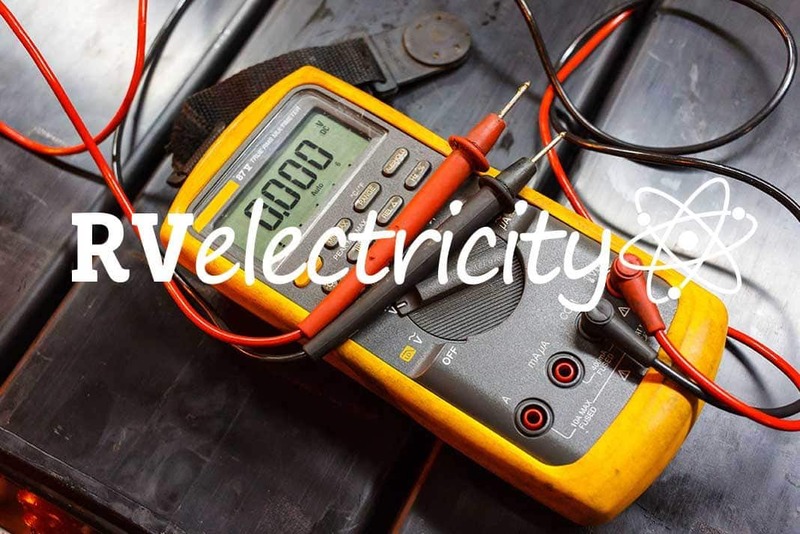 For our upcoming seminar schedule, including my Advanced 3-hour clinics in Funkstown and Hershey about RV Electrical Maintenance and Troubleshooting, please click HERE. I tried out a new format last week where I’m answering very basic questions for newbies. I named it J.A.M. (Just Ask Mike) and you all seem to love it. So J.A.M. will become a regular weekly feature. This will be in addition to my RV Electricity column every Saturday, which I’ll reserve for more complicated questions. Plus I’ll roll all of this new information into my monthly RV Electricity Newsletter which is published the last Sunday of each month. So, per your request, there will be even more answers to your RV Electrical questions. MjDjjaniczaktravel adventures: I’m installing a 50-amp hook up on our house to plug in our motorhome. Someone advised me that it was required to have its own ground. Could this outlet be installed by using only a ground to the house fuse box? Mike Sokol: The pedestal has to have its ground wire run directly to the ground bus in your home’s electrical panel. No secondary grounding rod for the pedestal is required. Terry Brown: Thanks to Mike’s 50-amp wiring diagram my electrician had no trouble installing an outlet. He’d never done one but it all checked out and sailed thru inspection. So electricians understand 50-amp NEMA 14-50 receptacles (their official name) and should easily be able to install one to code. However, a residential electrician may NEVER have seen a 30-amp/120-volt RV outlet (the TT-30), which is easily confused with a ’70s vintage 230-volt clothes dryer outlet. See the diagram on the left. 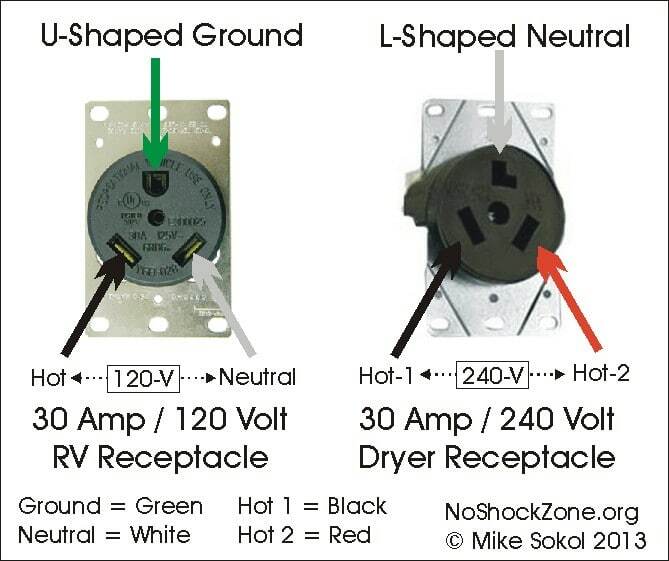 Note that while a dryer outlet is wired with 2 hots and a ground wire to provide 240 volts, the 30-amp RV (NEMA TT-30) outlet must be wired with one hot, one neutral and one ground to provide 120 volts. It’s a really expensive mistake if they miswire a 30-amp outlet for your RV with 240 volts. I have dozens of letters from readers who paid a residential electrician to wire up a 30-amp/120-volt outlet at their house, and miswired it as a 240-volt dryer outlet. Many thousands of dollars in damage occurred in just a few seconds after plugging in. ALWAYS meter any pedestal outlet (especially a brand new one) to be sure it has the correct voltage. In the meantime, let’s play safe out there…. Previous articleIs it safe to run that cheaper Walmart DEF? You moving to Facebook is like you moving to the moon. Good-bye Mike. Been nice knowing you. Mike it’s too bad to see you moving to Facebook. I know it’s easier for you, probably, but considering what people have to give up in privacy to join or belong to Facebook and its clones I feel it’s a very poor platform to share your vast & valuable knowledge. So True! I never use FAKEBOOK! So everyone listen up!!! I will accept ZERO bashing about anything or anyone on any of my articles, videos or pages. If I read FAKE anything one more time from anyone, you will be kicked off of everything I write. There will be no politics, no religion and no badmouthing here. If you want to learn what I have to teach, then welcome. But don’t test me or you will be banned. Great Mike ! Thats the way it should be !